First of all we need to be aware that we have left out part of this passage. But the passage contains God’s promise to Abraham, a promise that is everlasting. Essentially, God promises to be God to Abraham and Abraham’s offspring. What is omitted from our lectionary is the way that the covenant is to be lived out for Abraham and those that came after him in the Jewish faith—land, offspring, circumcision. It is not that the directive to circumcise becomes a condition of the covenant itself, but rather a sign of the relationship. The passage was probably written during the time of exile in Babylon. In the sixth century before the birth of Christ, Israel was devastated by the destruction of their city and its temple, the center of life, both political and religious. You know they were wondering where the covenant was. So the Priestly writer reminds them that God is there, that God promised an everlasting covenant, that God promised to always be with them and that God has faithfully kept that promise. This was a promise to hold on to even in the midst of the darkness of exile. It is a way of establishing (or re-establishing) the people’s identity. First, God appears to Abram and announces God’s presence. Abram falls on his face, incredulous at who is actually speaking to him. And with the covenant, Abram becomes Abraham and Sarai becomes Sarah. The covenant signifies a shift in who they are. God promises that Abram will have descendants. And they laughed. Well, of course they laughed. It was ridiculous. Abram and Sarai were old. All logic told them that their childbearing years were not just running out but were way behind them. It just didn’t make sense. But surprisingly, God often doesn’t make sense. And by retelling the covenant, by reminding the people over and over again of this everlasting promise, it lives. This becomes a personal story of God’s faithfulness to the people. The covenant moves into the future tense. It becomes something for which we are waiting and moving toward, which makes sense to read it during our season of Lent. (And, as we know, Abraham and his family that received this covenant never saw it come to fruition. It was enough to just live with the promise. It is a lesson to us all.) And it then calls us to look at our own covenant and our own relationship with God, as well as our own sign of that covenant in our baptism. That’s the crux. Truthfully, the promise means nothing without that relationship, without our entering into relationship with God and living the promise itself. This passage is the story of Abraham’s identity. Abram and Sarai are named “father of many people” and “princess of many”. Now Abraham and Sarah have a new identity, an identity that comes from this established relationship. The names and the new identity were bestowed by God but they come to be as they are lived out in relationship. That is what it means to be a covenant people. For Judaism, this is the establishment of their identity as a people. This is where they become the children of Abraham and the religious community is defined. And living out that identity is about believing and trusting in this promise that was given through Abraham. Abraham laughed. Sarah laughed. And I’m betting God laughed. (You can just imagine the inside joke between the three: “This is going to be good. No one will ever believe this could happen.”) Maybe laughter is our grace-filled way of getting out of our self and realizing that, as ludicrous and unbelievable as it may be, God’s promise holds. Maybe it’s our way of admitting once and for all that we don’t have it all figured out, that, in all honesty, we don’t even have ourselves figured out, that there’s a whole new identity just waiting for us to claim. In this Season of Lent, we are called to get out of our self, to open ourselves to possibilities and ways of being that we cannot even fathom. Go ahead and laugh. It is only the beginning. The promise holds. What meaning does the covenant hold for you? In what ways does the covenant shift who we are? What does this say about relationship with God? What does the idea of God not really making sense mean to you? What does the idea of the covenant living in “future tense” mean for you? Paul suggests here that faith is and has always been the primary basis of a relationship with God. This makes it possible for him to put Jews and non-Jews on the same level. What matters for both is faith. What matters is the belief that God can do what seems impossible, what doesn’t make sense. For Paul, this was the point of Jesus’ coming. He understands Jesus’ death as an inclusive representation of all humanity. He entered into death which he sees all humanity condemned by its own sinfulness and then rose from the dead. All human beings, then, through Jesus resurrection can enter into relationship, into covenant with God. In our pragmatic 21st century minds, sometimes it is much easier to grasp at the obvious and to make that the basis of our belief. But, as Paul reminds us, if our whole faith system depends on nothing more than adhering to the set of laws or interpretations that have been laid down by those that came before us, what good is faith? Remember that faith is about relationship. The law is not bad. In fact, it’s usually a necessary construct to help us understand, to help us point to that which we believe. But it is not the end all. It is not the God who offers us relationship. Now I don’t think Paul would in any way dismiss religion or even the rules. He’s just reminding us that they have their limitations. They are not God. In fact, it is easy for them to become idols of worship in and of themselves (and last I read that was frowned upon!). But they have their place. They provide a systematic way of at least attempting to understand something that, in all honesty, really makes no sense to us. (And, to turn it around, professing to be “spiritual and not religious” actually has a good chance of becoming a religion in and of itself.) An authentic faith, it seems, is one that weaves what doesn’t make sense into understanding, laughter into prayer, and a grace-filled encounter of the Divine into our everyday life. It is about both transcendence and meaning and, on a good day, the weaving together of the two into a Holy Encounter with the Divine Presence that it always in our life. What meaning does this “inclusiveness” mean for you? What does this say to you about covenant? In what ways do we “idolize” our religion? In what ways are the “rules” of religion important? For you, what does an “authentic faith” mean? Here, when Jesus begins to speak of his suffering, Peter will have none of it. Jesus rebukes him, then, with the familiar phrase directing Satan to get behind him. Rather than an anthropomorphic view of evil, this is more than likely a way of Jesus reprimanding Peter for espousing human values, rather than God’s. The writer of Mark’s Gospel makes us think about our own faith. The passage portrays Jesus as a model for the disciples. Each time Jesus speaks of himself as the suffering servant, we find the disciples preoccupied with the opposite, or with what makes sense to them in terms of the world in which they live. But Mark tells us that true disciples should be ready to take up their own cross. Now this was as foreign to those first disciples as it is to us. The disciples, like us, aspired to power and greatness for themselves as well as for Jesus. Like us, they probably wanted to be on a winning team. And, like us, they did not want themselves or those that they loved so dearly to suffer. But Jesus would have none of it. And it was hard to fathom that Jesus would, in their view, give up so easily. So who could blame Peter? He’s just like us! Even in this day, most of us are still looking for Super Jesus to come and make everything OK. But that’s not what we’ve been promised. That’s not what this way to the cross means. And to dismiss it with Anselm’s 11th century notion of Jesus being killed as a substitute for us sort of takes us off the hook. What happened to that relationship thing? 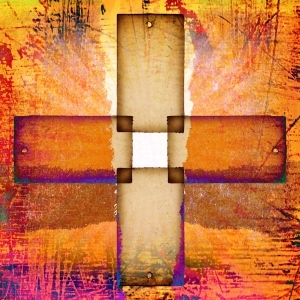 We’re not asked to just believe in Christ; we’re asked to follow….all the way to the cross. Now most of us are probably not going to be asked to give up our life for another. After all, we live pretty safely and pretty comfortably in the big scheme of things. So, what does that look like for us? What does it look like to bear our cross? Now I’m not talking about the cleaned-up, shiny cross at the front of the sanctuary! I’m talking about Golgotha, about standing up for what is right and for one’s beliefs whether it’s inconvenient, uncomfortable, or just downright dangerous. And even though most of us will probably never be hung on a cross for what we believe, we are called to live with different values, to let go of the things that impress the world—power, greatness, financial security, etc.—and to follow where God leads. So, what does that mean, to “take up one’s cross”? What is one denying by doing that? What are you being called to give up in your life to follow where God leads? How much of your life are you willing to relinquish to follow Jesus to the cross? O God, from whose eyes the measure of our faith is not hidden, wrench from us now all religiosity, all rules and regulations of our scheduled selves that separate us you’re your Holy Spirit. O God, who calls each of us by name to be the church, give us love enough to make a difference, give us vision enough to follow, give us endurance enough to hold steadfast in the face of the unholy. O God, who claims us as disciples, bless us now and touch us with your holiness that we might have commitment enough to be good news to [all the world]. Amen.